The Raspberry Pi Foundation announced "Raspberry Pi 2" today, a new powerful Pi which has the same form-factor and price ($35) as the old Model B+. For those not familiar with the Raspberry Pi, this is a credit-card-sized computer which runs Linux (and Windows 10 starting with the new Raspberry Pi 2, see below), created with the intention of promoting the teaching of basic computer science in schools. A wide variety of Linux distributions are available for Raspberry Pi, such as Raspbian (Debian Wheezy), Pidora (Fedora remix), Openelec and RaspBMC (XBMC Media Center) and Arch Linux. The new Raspberry Pi 2 Model B features a much more powerful CPU - a 900MHz quad-core ARM Cortex-A7 -, and twice as much RAM as the old Model B+ (1GB LPDDR2 SDRAM). Other than that, the old Model B+ and the new Raspberry Pi 2 are pretty much the same - they both ship with 4 USB ports, a MicroSD card socket, an Ethernet port, HDMI 1.3 & 1.4 video/audio socket and they are fully compatible: the connectors are in the same place, have the same functionality and both can run from a 5V micro-USB power adapter. The announcement mentions that thanks to its ARMv7 processor, the new Pi can run "the full range of ARM GNU/Linux distributions, including Snappy Ubuntu Core" (a package for NOOBS will be available in the next couple of weeks), "as well as Microsoft Windows 10". Furthermore, the Rasperry Pi Foundation has been working close with Microsoft to bring Pi-compatible Windows 10 free of charge to the new Raspberry Pi 2. 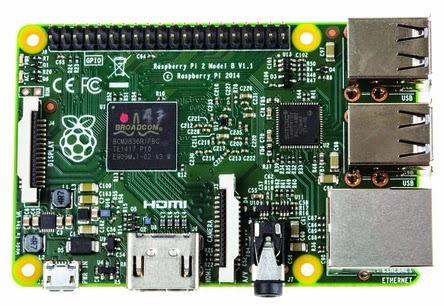 You can buy the new Raspberry Pi 2 from element14 and RS Components.